Zombies and experiments and captives, oh my! 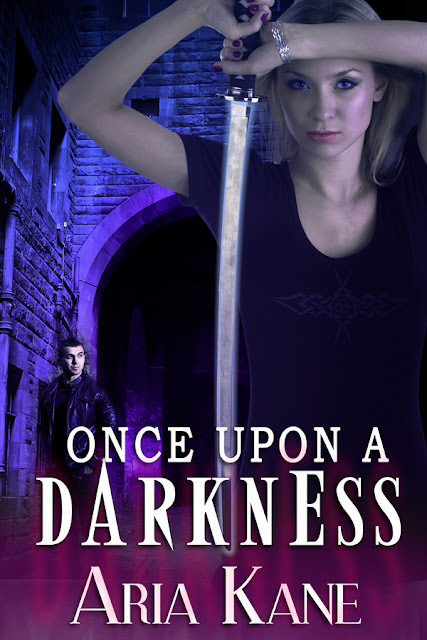 I'm excited to be a part of the cover reveal for Once Upon a Darkness by Aria Kane, available from Entranced Publishing on June 17. A healthy sprinkling of sci-fi twists the zombie genre on its head in this dynamic dystopian thriller. Read more about the book below, then check out the cover reveal and enter the giveaway below! Add Once Upon a Darkness on Goodreads! Aria Kane is a recovering mechanical engineer and romance writer. She lives in sunny Florida with a 60 lb mutt who thinks he's a Chihuahua. You can learn more about her at ariakane.com or on Twitter @aria_kane. What do you think of the cover? The description sounds great and the cover looks good, but I wish there were a zombie on it somewhere! From the cover you'd think this was a demon-hunter novel. But I love the subtle spookiness of the prison in the background. To celebrate the Once Upon a Darkness cover reveal, Aria is giving away a $20 giftcard and an ecopy of an Entranced book of the winner’s choice.